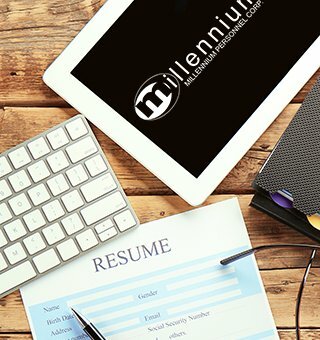 Resume Writing Services | New York City | Millennium Personnel Corp. The Right Resume Writing Services Can Help You Land Your Dream Job! Are you sending out hundreds of resumes, but getting no interview requests? The good news is: It may not be you, it might be your resume! Our resume writing services can help! We service not only New York City resume builders, but resume builders across the USA. And all of our custom resume writing is done in-house by Professional Recruiters. Therefore, we know how to create resumes and resume portfolios that contain those digitally enhanced key words and phrases that employers search for when selecting candidates to interview. Interested? Get started here. Simply fill out the form. Contact us at (212) 244-2777 to discuss your needs with a Resume Specialist and request a quote for your resume building project. If you approve the quote, we request a small deposit. There are no lengthy forms to fill out. Your Resume Writer will present a draft for you to review. You can request any changes. We will present you with a finalized version of your resume in any format you wish, such as PDF, or MS Word, etc. and the final balance will be paid upon your satisfaction. Contact us at (212) 244-2777 to discuss your needs with a Resume Specialist and request a quote for your resume building project.